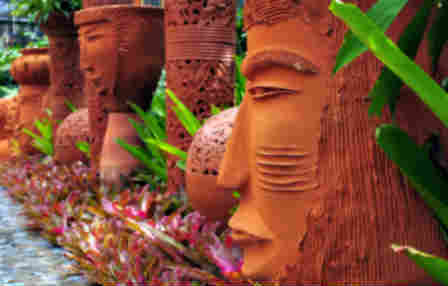 Decorative Garden accents are a valued addition to most modern gardens. demands variety and an element of mystery that are greatly advanced by the use of bold garden accents. 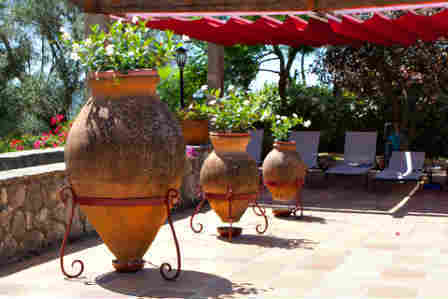 Accenting your garden with interesting focal points is an exhilarating endeavor that gets the creative juices flowing. Accent with manmade materials or with attractive specimen plants - either approach conveys a personal message that celebrates the soul of the tending gardener. How do you plan for bold decorative garden accents in your garden? What elements might a designer use to bring drama to your small garden design? Think about these things to add a personal touch to your garden. Scale and proportion are an expression of visual balance. By influencing the visual perception of the elements in a garden, the designer can greatly affect the character and impact of the garden space. Oversize containers or large exotic plants set the stage for a dramatic garden. 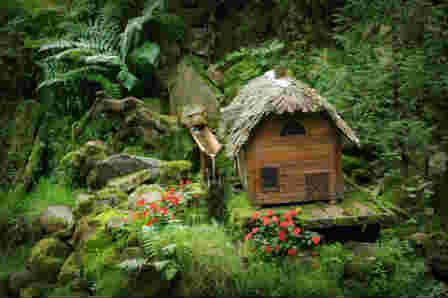 Designing for diminutive size in plants and furnishings in a garden site will convincingly argue to the garden visitor that they have stepped into a world inhabited by little people, and transform the mood of the garden into a fantastic fairy garden. Correct proportion and scale is as vital to a pleasing garden design as is the planning of functional areas. Pay close attention to how proportion and scale work together as you plan for decorative garden accents. We are infinitely fascinated by things novel...whether miniature or immense in proportion, these things pull at our minds as we try to make sense of them. We imagine a back story as easily as we call forth speech...our minds are transported to other places, other times, other worlds by these incongruities in our ordered world. Make use of this human characteristic as you design your garden! It not only fascinates us, it continues to bring joy to us as we live in the space. By bringing these elements into your garden, you introduce the element of fancy. Young or old, practical or visionary, these imagined elements excite comment and tug at emotion. Staged decorative garden accents can incorporate humor, introduce a commentary on life events, or add an element of the fantastic. The only limit is your imagination. One word of caution here. 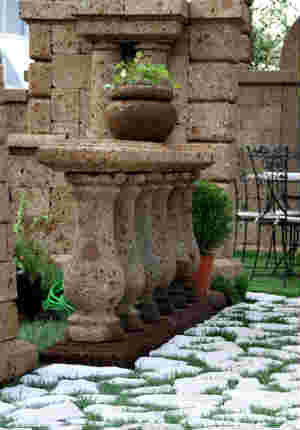 Most small gardens cannot accommodate more than one, or at the most two or three of these staged features. If overused, this technique can cause your garden to take on the characteristics of an odd museum, relegating the garden to a secondary status. Exploiting our human tendency toward delight at encountering novel situations isn't entirely limited to the creation of garden "scenes". We are also fascinated by the use of everyday items in unexpected ways. This technique is useful, aesthetically and practically, as often the use of these everyday items provides additional opportunities for planting! Shoes, kitchen pots, tools, old furniture or even discarded bathtubs can all be dressed in finery and employed in this fashion. Paint them if they don't have their own intrinsic charm, plant them up, and stage them in a dark corner or as a focal point in a perennial bed. Add them to a patio area, hang them from trees or use them as a support for clambering vines. You are only limited by your imagination. The obligatory caution here...overuse of this sort of addition to the garden can create an impression that your garden is in use as the local dump. Use this idea judiciously! The use of decorative garden accents in your garden is all about directing the eye. It can be accomplished in a thousand different ways, and the use of bold color is an obvious choice. 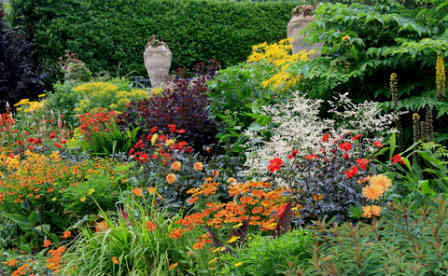 Just as the use of proportion and scale in the garden helps to bring balance, so does color act as a visual manipulator. 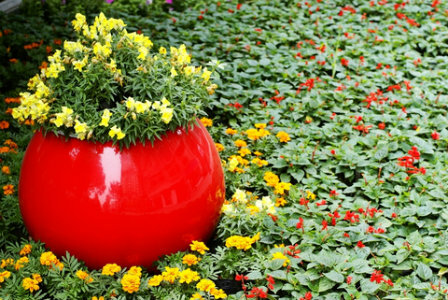 Boldly colored plant containers are fun, often are inexpensive, and they perform the function of stopping the eye. They are a primary means of creating a sense of rhythm and motion in your garden space. The garden in the above photo would lack interest without the use of the bright and polished red planter. It adds a counterpoint to the yellow flowers within which it sits, while adding importance to the diminutive red flowers provided by a dense groundcover. Interest is created when our eyes pick out an element of the garden as a stopping point. In this case, the red planting container performs that needed function. This same function can be applied to items such as garden fences, outdoor seating, or other introduced elements in the garden. Use of colorful items anywhere in the garden can provide the interest required to elevate your garden style. Most homeowners neglect this idea as they develop their garden plans. The primary reason for this is a lack of patience! It often takes time to add architecture to the garden and to take advantage of these decorative garden accents as part of the treatment of the garden. Yet these elements are likely to add the most effective sense of permanence and an undeniable presence to your garden, so it is well worth the expense and the wait to incorporate them early in your garden planning. Garden architecture and design elements are added through many venues, from patios to walls, boundaries, gates and arbors to water gardens and fountains. Even strategically placed large rocks can provide a sense of strength to the garden design. These structural elements add year round dimension to your garden and act as decorative garden accents throughout the life of the garden. If you are planning your small garden design now, think this through, decide on a plan to add these structural elements, and then be patient until you can afford to add them. If you've already planted your area, consider revamping your garden to add these elements. It will transform your garden from a fleeting and transitional beauty to a year round design feature. 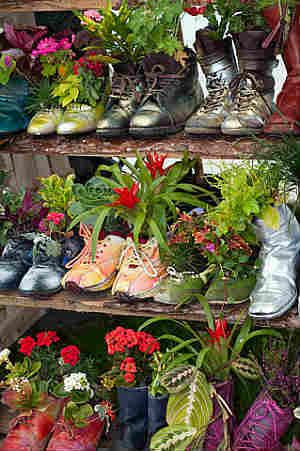 Decorative garden accents can absolutely be created without the addition of manmade objects to your small garden design. Some of the most impressive gardens in the world are entirely made up of carefully placed and incredibly beautiful plants, with very few manmade objects added. Nature lovers everywhere will be happy to know that all it takes is the judicious placement of garden plantings to take advantage of their natural characteristics. Take advantage of color values, visual texture, plant form, and plant structure and incredible plant foliage to create a varied tapestry difficult to tear your eyes away from. In the garden above, note that the repetition of color and plant forms leads the eye through the garden. Reds, yellows and purples have been placed in such a fashion that they accent the garden, sweeping your eye from colorful clump to colorful clump. Plant size and form have been used to create visual texture and interest throughout the garden. In this case then, the accentuation of colorful foliage and flowers has performed the function of creating visual rhythm, thus manipulating the eye through the garden. It is not always necessary to combine plantings in order to enjoy the benefit of having created natural decorative garden accents to manipulate the eye. Some of God's creations have enough allure to act as accents on their own, without our interference. 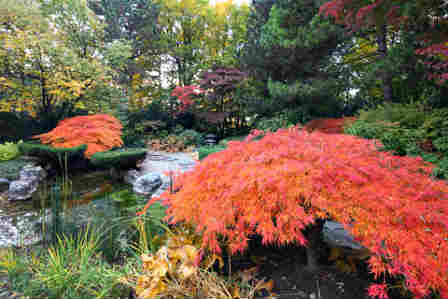 Plants such as the Japanese Maple have enough visual interest to arrest our attention without help. The fine textures of many varieties of this plant cause it to stand out even when it is not displaying its fiery autumn colors. Other plants that perform this function admirably without any help are Dwarf Cedars, Japanese Barberry, Cotinus, Heathers and Viburnum. This list only just scratches the surface of the potential specimen plants that can be used as decorative garden accents in your landscape. Why bother with decorative garden accents? Nature is incredibly beautiful without our interference isn't it? Decorative garden accents do provide a level of sophistication and elegance that is present in only the rarest instances in our backyard spaces. Nature is breathtaking on a larger scale...so our postage stamp gardens may not have been fortunate enough to benefit from its bounty. The smallest space can incorporate beauty of course, but the use of garden accents can magnify that beauty by providing a sense of order to a garden space. Is accenting the garden necessary? No. Think through your garden spaces and make some decisions regarding your use of these accents. Some small portion of you folks are fortunate enough to have naturally formed focal points deposited in your gardens. The rest of us will benefit from adding those things ourselves!